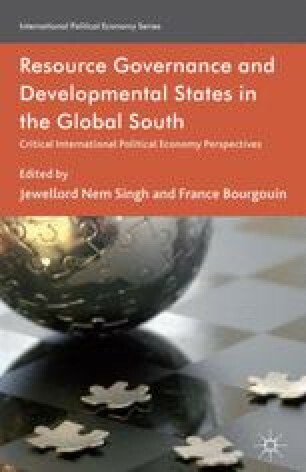 This chapter evaluates the current debate within South African academic and policy communities about whether or not South Africa is capable of becoming a ‘developmental state’. It does so by addressing two prior questions: To what extent is developmental state theory and practice consonant or in conflict with neoliberal reforms and policy norms? And: Are theories developed from other regions and systems of accumulation relevant to states for whom mineral extraction presently constitutes a major sector (or the predominant mode) of economic activity? In so doing, it is necessary to distinguish the question of whether developmental states are even possible from that of the nature of state autonomy or state capacity. Particularly in ‘development studies’ literature, these latter issues are often conflated with developmental states, with ‘capacity’ in particular often invoked in apolitical, technocratic terms. But if developmental projects are of any consequence or show any ambition — and the idea of a ‘democratic developmental state’ (DDS) is nothing if not ambitious — then it is well to acknowledge at the outset that these terms and goals are thoroughly political.